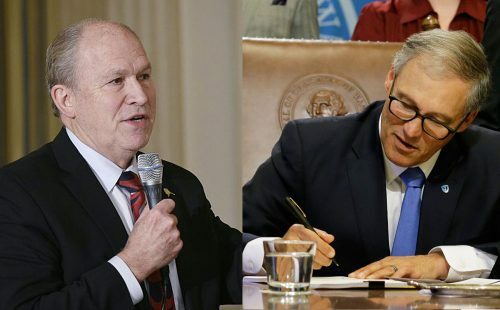 The governors of Alaska and Washington are questioning the data cited by U.S. Attorney General Jeff Sessions in recent letters he sent to their states regarding the efficacy of their respective marijuana regulatory regimes. Governors of four Western states that have legalized recreational marijuana — Alaska, Colorado, Oregon and Washington — each received letters from Sessions dated July 24, responding to a joint letter the governors sent Sessions on April 3. In each letter, Sessions referred to regional and state data depicting serious public health and safety issues arising from marijuana legalization. The Cannabist has obtained copies of each of the attorney general’s July 24 letters to those states. Late Tuesday, The Cannabist obtained copies of Alaska and Washington’s respective responses to Sessions. Both states note that the data Sessions utilized when discussing their state’s respective regulatory regimes is out of date and incomplete. In his July 24 letter to Alaska, Sessions cited data from the state’s 2015 State Trooper Annual Drug Report, and questioned whether the state’s regulatory framework adequately protects federal interests. Alaska Gov. Bill Walker and his Attorney General Jahna Lindemuth responded in a letter dated Aug. 14 that the 2015 data cited by the attorney general could not “be fairly attributed” to the new marijuana regulatory system since legal sales in the state did not begin until 2016. “The report simply does not speak to the success or failure of the new regulatory framework,” they wrote. In their August 15 response to Sessions, Washington Gov. Jay Inlsee and Attorney General Bob Ferguson pushed back forcefully on the U.S. Attorney General’s citation of data from the March 2016 Northwest High Intensity Drug Trafficking Area (NW HIDTA) report on marijuana in the state. “Your letter … makes a number of allegations that are outdated, incorrect, or based on incomplete information,” they wrote. Inslee and Furguson pointed out that the HIDTA report Sessions cited was issued just four months before the state implemented legislative reforms that addressed many of the Depart of Justice’s (DOJ) concerns. Sessions had also cited the report in stating that Washington marijuana had been diverted to 43 other states. Inslee and Ferguson argued that this finding was based on statistics covering “several years before our recreational sales began,” they wrote. The pair also called out Sessions for repeatedly failing to “distinguish between marijuana activity that is legal and illegal.” By conflating the two, Sessions implied that state-legal marijuana was responsible for harms actually caused by illegal activity, they wrote. In addition, they wrote, “Some of the statistics cited in your letter are simply incorrect, or based on misreading of their context.” In this category they included an incorrect and highly inflated calculation about driving while under the influence. The Cannabist has confirmed a response will be forthcoming from Colorado Gov. John Hickenlooper and has made an inquiry to Oregon Gov. Kate Brown’s office. The letter from Alaska officials also raised the issue of states rights, including state law enforcement. In all four letters, Sessions indicated that he sees flexibility for federal enforcement actions under the 2013 Cole Memorandum — Obama-era guidance for how prosecutors and law enforcement could prioritize their marijuana-related enforcement efforts.